All dogs need proper training. Whether you are sharing your home with a new puppy or an adult dog, it's never too soon to start training your dog. Most dogs are happier with the structure and confidence that comes from training. It can feel overwhelming when you first begin to work on dog training. If you're unsure where to begin, develop a week-by-week schedule to help you get organized. Each week, choose one or two basic commands to work on. Plan to make some adjustments to your dog's environment in order to prevent or modify behavior problems. If you haven't already been using a crate, this is a good time to get your dog used to it. The crate is a good tool to manage your dog's behavior when you aren't there to supervise. Take a little time each day this week to let your dog get used to the crate, and begin letting it sit in there for a few minutes at a time. The dog may eventually prefer to sleep in its crate. Start leaving the dog in its crate for longer periods of time, but no longer than a few hours at a stretch. Be sure to leave some fun and interesting toys. Continue using the crate throughout your dog's training. Most dogs enjoy having a sanctuary of their own. Crates also can help with housetraining, since most dogs will not defecate or urinate where they sleep. Dogs thrive on routine. Create a schedule of mealtimes, walks, and playtime. Remain consistent on both weekdays and weekends. If a dog walker or someone else will be caring for your dog, make sure they are aware of the schedule as well. Stick with the routine as closely as possible during the dog's training and beyond. This will help your dog know what to expect and when. It's also beneficial for housetraining since your dog will begin to learn the exact times it can go outside (ex: after every meal, the dog gets walked to relieve itself). Try a wide variety of toys for your dog. Make sure to include some things such as Kong toys or Buster Cubes which provide some mental stimulation. This will keep your dog mentally engaged, which is important, especially since most owners are not available to play with their dogs all day. Don't give your dog all the toys at once. Each week throughout this process, rotate the different toys so your dog always has something new and interesting to play with. Learning commands is essential for dog training. Your dog needs to know how to respond to its owner in order to stay safe. Start with the more basic commands and once those are mastered, move on to others. Sit: Work on teaching your dog to sit. Plan on spending about 5 minutes a few times each day working on the "sit" command. Down and Emergency Recall: Next, spend a few minutes several times each day working on the down command and teaching your dog the emergency recall. Come and Leave It: Once your dog has mastered "sit" and "down," you can move on to these more complicated commands. Stop Jumping: You can set aside time each day to practice this behavior, or you can wait until it comes up in your regular day-to-day activities (like when your dog jumps up to greet people coming in the door) to work on it. Review: Take 10 minutes at least 3 times each week to review the commands and behaviors you've already worked on. Wait: You can practice this in regular training sessions, or you can wait for opportunities to crop up each day. Make sure your dog waits before going outdoors or coming out of its crate. Go to Your Place: Begin working on teaching your dog to go to a specific place and lie down in your home. Some great times to practice having your dog lay calmly in place: during mealtimes or when you're sitting watching television or reading a book. 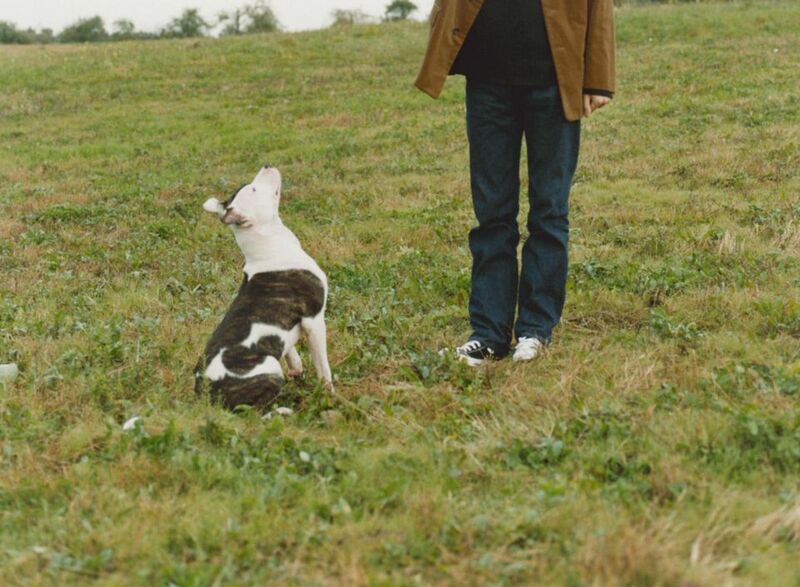 Drop It: In several short training sessions each day, teach your dog the "drop it" command. Stop Barking: Begin training your dog to be quiet by working on the "speak" and "quiet" commands. You can do this during training sessions or you can wait until your dog barks and use it as an opportunity to practice. Begin teaching your dog to walk on a loose leash. This will teach your dog to safely walk, which is important for both the dog and the walker. Plan on at least one short walk each day to practice this skill. This is a skill that you should continue working on throughout its training. If your dog knows many basic commands, you can work on teaching it tricks such as "roll over" or "play dead." If your dog probably has a pretty firm grasp on walking on a loose leash by now, if you would like a little more control during walks, you can now introduce the "heel" command as well. Tricks are not essential but can be fun for your dog and allow them to receive praise for good behavior. After focusing on a technique per week, your dog should be responding well to a number of commands. This does not mean you're done with training. Rather training must be practiced and reinforced over your dog's lifetime, which "proofs" the behavior. The training will ensure that your dog is a happy and well-adjusted member of your family. If you are having trouble with the training or a certain step, it can be helpful to sign up for a training class (usually with other dogs) or speak to a canine behavioral specialist. They can set up one on one sessions with you and your dog (and perhaps group sessions), to get to the root of the training issues and come up with long-lasting techniques.